Fanplayr was recently featured in the Italian publication DailyNet, “The newspaper of network marketing”. Here is the article in Italian with a translation below. Recently released in Italy, the company is able to generate an increase in AOV and conversions for online stores, with a compensation model based solely on sales augmented sales. Just six months after arrival in Europe – Fanplayr, the American company founded in Palo Alto California in 2011 – acquires customers in France, Germany and Spain following from its initial significant successes in Italy. Fanplayr uses a technology that caters to the world of ecommerce: using realtime intelligence to deliver relevant offers, Fanplayr is able generate an increase in AOV and conversions for online stores, with a compensation model based solely on sales augmented sales. Fanplayr technology ensures total transparency on the sales it generates, being able to assign a unique coupon code to each transaction. Fanplayr technology is based on a system of artificial intelligence that monitors visitors and customers of an online store, tracing behavior. Once you have collected a sufficient number of profiles and information, Fanplayr allows you to identify visitors and customers with a similar profile. That’s why discount offers generated in real time by Fanplayr are intelligent, because they recognize new customers who may need a relevant offer to convert and those who are already customers or do not need incentives. 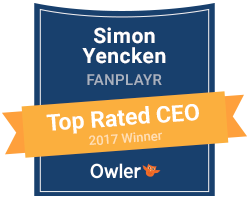 A few months after the entry of Fanplayr in Europe we have had great interest from the market. In Italy we immediately started working with important clients such as Boccisport. it, Macrolibrarsi.it, Cisalfa-Sport.it, Unilibro.it, MobilClick.it, 100x100ufficio.it and CalcioShop.it. Calcioshop in just two months has made outstanding achievements: thanks to Fanplayr and the ability to target segments with certain incentives they have seen an increase in the Conversion Rate equal to 50.14% and increase AOV of 12.58%. The result is all the more remarkable when one considers that the mapping of behaviors traced by Fanplayr improves in proportion to the number of visitors monitored over time. And with Calcioshop.it just the beginning.